During the last six years, we have seen a general recovery of the world’s economy from the last big economic crisis in 2008, with some specific and interesting contrast between the advanced and emerging economies. In the first half of this decade (2010–2015), Latin America and the Caribbean (LATAM) enjoyed a steady economic growth of 6.2 percent, while the European Union, the US, Canada and Japan were struggling to reach 2.7 percent annual growth. This tendency is the same in the media and entertainment industry, in which LATAM experienced healthy 8.9 percent yearly growth, versus a 4.1 percent in the most advanced economies for the same observation period. Even though the economic-growth tendency in LATAM changed during the last two years, driven by a decrease in oil prices and other commodities in the region, we still expect a healthy yearly growth of 5.6 percent, versus 2.4 percent in Europe and 3.5 percent in North America, until 2020. However, not everything is good news for the traditional media and entertainment players in LATAM, which have enjoyed this growth. Shifting from an 8.9 percent to 5.6 percent yearly industry growth rate, traditional players will start to notice erosion in their income, driven by a surge of new digital trends and players that will become more relevant in the coming years – just like the advanced economies are experiencing right now. The news and print industry will experience the biggest pressure in its revenue structure. Traditional players will struggle to protect their income and decrease their share of advertising revenues. In addition, consumer spend will migrate to new online business models with lower rates and higher reach. The “books” industry will also be disrupted, as distributors will have to compete against new business models in which consumers can get their desired content directly from authors. The TV and video industry will experience growth that will compensate for the value shift to new online players, at least until 2020. This scenario might look different in countries where the population’s connectivity and availability of electronic payments evolve fast. The music and radio industry will be the least affected in the coming years, given the population’s low connectivity and lack of access to electronic payment options, which limits the reach of new online music services. The gaming industry, which traditionally has held the highest online share of all media segments, will continue to experience growth based on digital distribution and massively multiplayer online games. 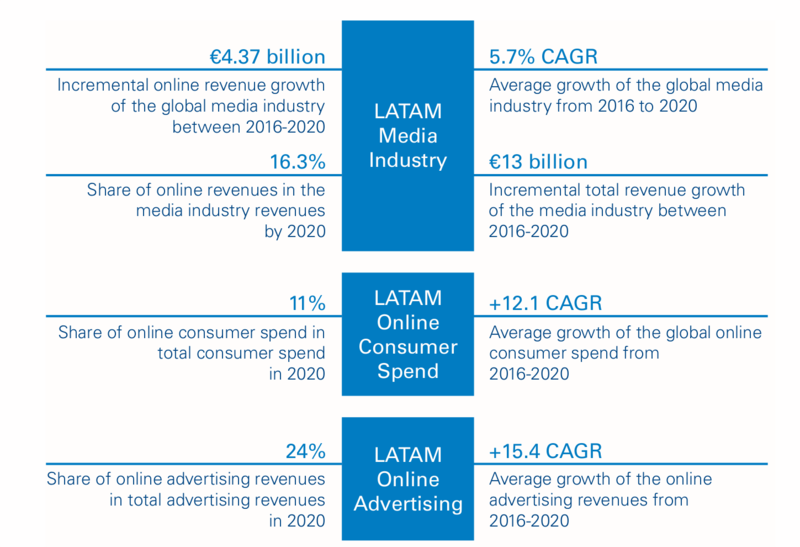 In general, the impact of new online players and business models will not be as critical in LATAM as in other regions in the next three years, thanks to the low connectivity and banking levels of the Latin American markets. However, this situation will not last forever, and traditional players should learn from what is happening in the most advanced markets and prepare to compete with the new entrants disrupting the entire industry via other markets.